Cornyn: Two Cycles To Reach Republican Senate Majority : It's All Politics Sen. John Cornyn, head of the Republican effort to recruit and fund GOP Senate candidates, says it may take two cycles -- this year and 2012 -- for his party to win a majority of seats. The battle for control of the House has been center stage in recent days, with Republicans -- and Democrats as well, notably White House Press Secretary Robert Gibbs -- discussing the prospects of a GOP takeover. Gibbs' comments, made last week on NBC's "Meet the Press," caused a stir. But he was saying what everyone else has been saying: that the House is "in play." There are enough competitive House seats out there where control of the chamber is up for grabs. Republicans need a net gain of 39 seats to make John Boehner speaker. It's a different ball game in the Senate, where 36 seats are up in November and the GOP needs a net of ten to take control. A tougher climb for the Republicans, one that few analysts expect to happen. And that includes Sen. John Cornyn, the Texas Republican who heads up his party's campaign committee. -- For all the "expectations game" playing that is going on in Washington, Cornyn says that while he anticipates picking up seats this year, it's going to be a "two-cycle effort" for the Republicans to gain a majority. He said the GOP is leading or tied in eight seats currently held by the Democrats and is leading in all the Republican-held seats. 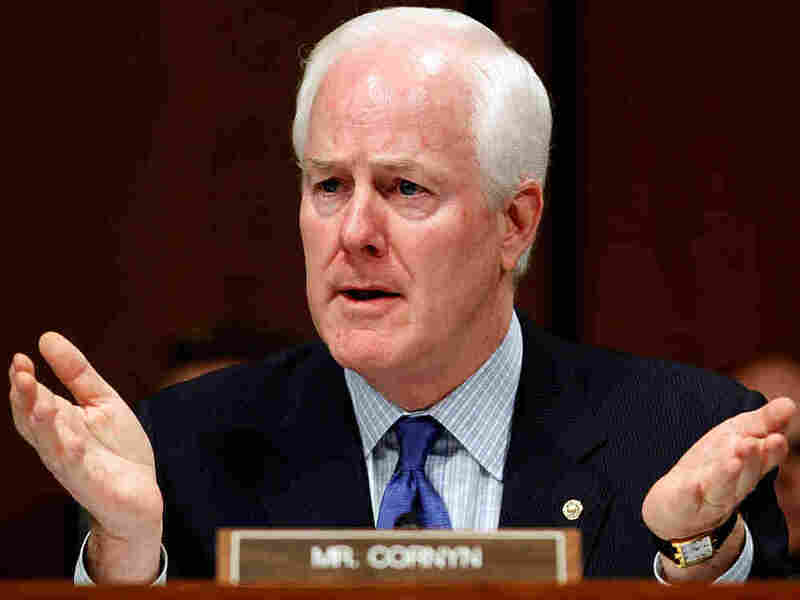 I'm "praying for a tsunami," Cornyn said, and anticipates a net gain as much as eight. But he is looking forward to 2012, when only nine Republican seats will be at stake, compared to 23 held by the Dems. -- The National Republican Senatorial Committee, which he heads, has more than $4 million to disperse among GOP candidates -- up 20 percent from two years ago. "Our biggest problem is going to be allocation because we have so many competitive races," he said. He expects the party to field a "competitive candidate" in West Virginia this year, assuming that state's Legislature changes the law to allow a successor to the late Sen. Robert Byrd (D) be chosen in November. (Gov. Joe Manchin, the all-but-certain Democratic candidate, named a placeholder on Friday in Carte Goodwin, his former legal counsel.) He says the committee has reached out to both Rep. Shelley Moore Capito and two-time Senate candidate John Raese about running, and argues that with President Obama's unpopularity in the state, the election presents a "great opportunity" for the GOP. Nonetheless, Republicans haven't won a Senate race there since 1956. -- As for the criticism he got from conservatives when he endorsed Pennsylvania's Arlen Specter, then a Republican, for re-election, as well as Florida's Charlie Crist, also then a Republican, and Trey Grayson, the choice of the party establishment, in Kentucky, Cornyn said that after the disastrous 2006 and 2008 cycles, it was tough getting candidates to run, and he was looking for those who could win. Obviously, "circumstances changed," he said, alluding to the difference in political fortunes for both parties since 2009. -- He said the influence of the Tea Party on the GOP was a "positive development." But as for the charge by Tea Party activists that Alaska's Lisa Murkowski was a RINO -- a Republican-In-Name-Only -- he dismissed that out of hand. And as someone whose role it is to make sure the party's incumbents are returned to office, he had warm things to say about her and another senator being challenged in the primary by the right, Arizona's John McCain. -- Texas, of course is a Republican state right now, but soon it will become a predominantly Latino state. And while George W. Bush made it a priority, as governor and president, to reach out to Hispanic voters, immigration has been a thorny issue for the GOP's efforts on that behalf. Cornyn's views on illegal immigration, for example, are not the same as Bush's. How can the Republican Party keep the Lone Star State Republican, and what can it do to bring Hispanics into the fold? The senator would only acknowledge that the Republicans "need to do a better job" in getting Hispanic support. -- Finally, Cornyn seemed unconcerned that Bush's memoirs, which are scheduled to be published on Nov. 10, may be leaked before the election. Does he want Bush to be part of the conversation as his party is trying to pick up seats in the midterm? "President Bush's stock has gone up a lot since he left office," Cornyn insisted, with a "lot of people looking back with more fondness" for him. If you miss the interview on TV, you can watch it at this link at C-SPAN.org.